The Van Hool EX 16H. 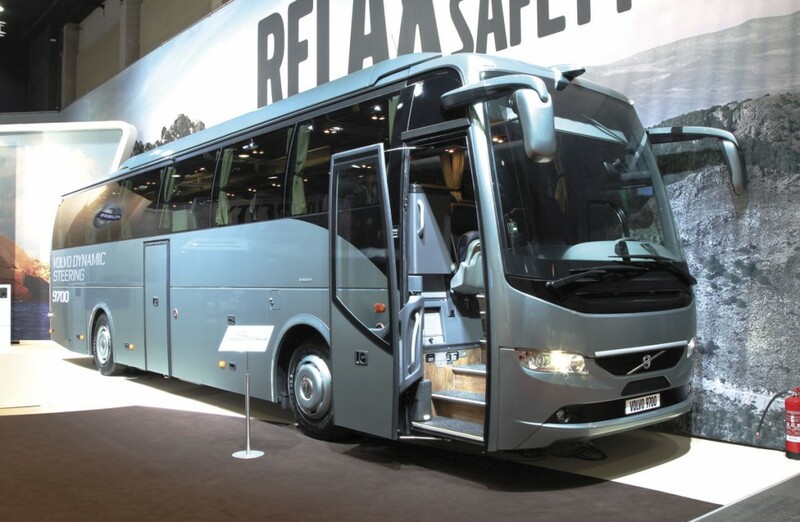 The Volvo 9700 with Volvo Dynamic Steering (VDS). Originally more a coach show than a bus show, the balance of the Busworld exhibition, staged last week in Kortrijk, Belgium, has changed over the years. 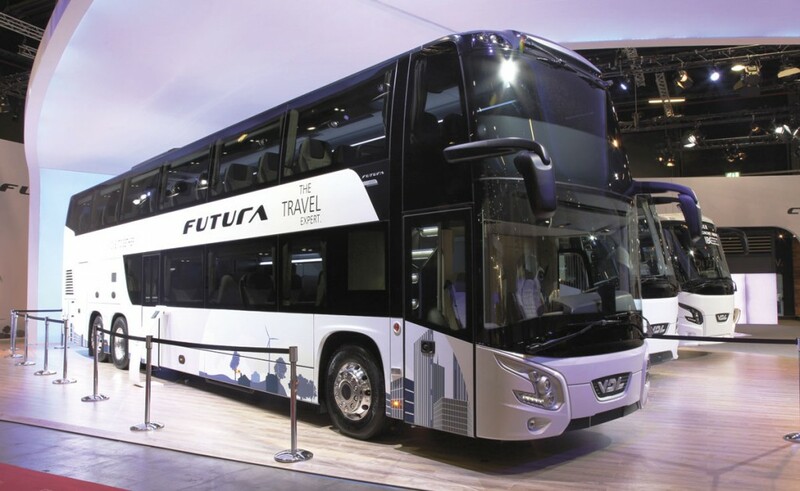 Europe’s, and almost certainly the world’s, biggest event dedicated entirely to bus and coach, it attracts manufacturers from all over the world with a growing Chinese presence. Bigger every year, this year it filled nine halls and was augmented by a large number of demonstration vehicles outside, many of which were available for evaluation. In this report we will try to bring you some of the highlights. Stuart Jones will be looking at coaches and David Cole at buses, where the emphasis was very strongly on alternative propulsion systems, especially electrical ones. We’ll save coverage of some of the many trade stands for a later issue. 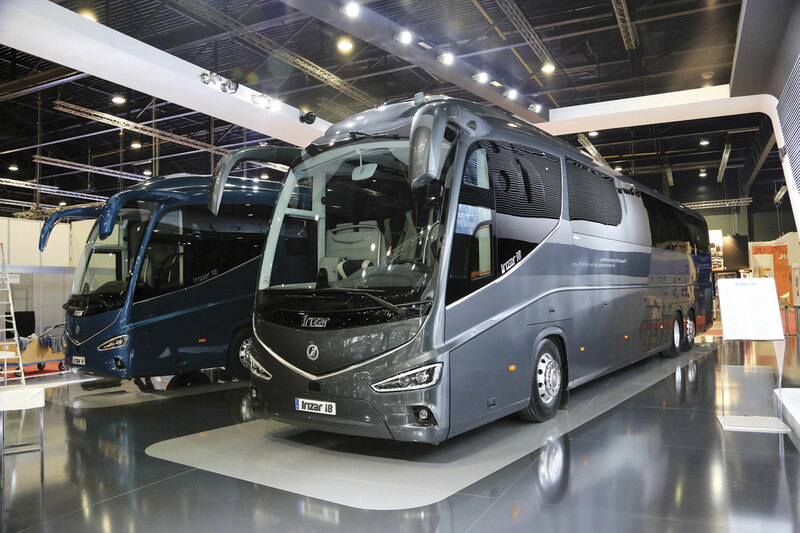 Irizar was making a strong statement about the changing nature of its business with every vehicle displayed of integral manufacture. One third of production is now accounted for by integrals. Development has seen €20m spent, of which half was specifically for the i8 and half for technological systems that will be carried over to the rest of the range. The use of stronger steels has enabled the weight to be lowered, all body panels are composites or aluminium, the aerodynamics have been improved, alloy wheels are standard and the oil change interval has been extended to 100,000km, all of which should help to reduce cost of ownership. Only one height is being offered and that is 3.8m (which is 3.98m over the air conditioning). There are four length options: 12.4m on two axles and 13.22m, 14.07m and 15.0m on three axles and the longest versions are close to a tonne lighter than the chassis mounted versions that will also be offered. High or low mounted centre toilets can be fitted and there is also a rear saloon toilet option. Seats can be 2+2, 2+1 or 1+1 according to customer’s choice and the floor is always flat. The International Coach of the Year 2016, the Iveco Magelys. I’m told that the price will be approximately 7% more than that of a fully loaded i6 equivalent, though it won’t be possible to specify an i6 to the same level. Both the integral and chassis mounted versions will be available at approximately the same time and right hand drive orders have been taken for both. Steve O’Neill of Irizar UK confirmed that the UK will be offering the 13.2m and 14.07m models with six of the longer variant already sold. Clarkes of London, Stewarts and Ellisons will each take two for football club work. I understand that the PB will continue to be offered for the next 12 months for those left hand customers that want it, but there won’t be any more integral versions in the UK. Van Hool dedicated the whole of its stand to coaches, which was slightly surprising given how extensive the range of bus products it offers is. The big story was the unveiling of the first tri-axle versions of the Paccar/DAF MX340 powered EX range, which follow on from the two-axle models launched at the IAA in Hanover last year. With more than 100 of the stainless steel framed EX coaches sold and more than 40 two-axle EX15H and EX16M models already on the road, the new options are the 13m EX16H and 14m EX17H, the latter giving a maximum capacity of 65 passengers. They are supplied in right hand drive through Arriva. The EX is built at the new plant in Macedonia which has an annual capacity of 600 units and has already delivered 800 coaches, the majority of them so far for North America (where Van Hool is number one in the market with a 38% share). With the EX it is now also building for Europe, and one of the four examples shown was the first right hand drive EX16H for the UK, shown in an Arriva demonstration livery, although all of the other coaches on the stand were in customer colours. A concern with new plants in far away places is whether the quality will be up to the mark but the finish of the Macedonian vehicles was at least the match of those built in Belgium. The TX range remains very much part of Van Hools offering and a wide selection was shown, including the TX11 Alicron, TDX29 Astromega, TX16 Acron, TX17 Altano and TX17 Astronef with its sloping window line. A new option is the availability of the Allison B525R automatic transmission in conjunction with the MX13 engine, an option I understand that was prompted by a request from De Zigeuner but is proving popular with other customers. An example was available for test drives. Van Hool’s main coach offering in the USA was the CX45, which has been joined this year by the shorter CX35 model and the TDX25 Astromega. In a speech, Fillip Van Hool revealed that 1,050 Astromegas had been delivered to Europe and North America over the past five years. Recent deliveries include 37 for Souter Invest in Finland and 40 on Scania chassis for Germany. 2016 will see 16 Euro6 TDX24 Astromegas delivered to Japan for customers including Hato Bus. There was considerable interest in coach developments on the Volvo stand though there weren’t actually any brand new models. What caused the stir was the launch of the new Volvo Dynamic Steering (VDS) system which Volvo claim substantially improves directional stability, comfort and safety, as well as significantly reducing the risk of occupational injury. Already offered on trucks, VDS is being integrated into the Volvo 9500, 9700 and 9900 as well as chassis with eight or 11 litre engines for Euro6. It utilises an electrically operated motor, attached to the steering shaft and: ‘Working in tandem with the hydraulic power steering, the electric motor is modulated by the electronic control unit thousands of times a second. At low speeds, the electric motor generates additional power, while at high speeds the steering is automatically regulated, compensating for irregularities which pass up to the steering wheel, from grooves or hollows in the road surface.’ Cyril Kenzie went for a ride on a test coach and after seeing how easy it was for the driver to control told me that it was ‘magic’. I’m including the new Scania Interlink in my coach review because, under the strapline ‘Specially designed for everything’ the range will grow to include a number of more obviously coach type models, indeed the Finnish built model will ultimately replace the existing OmniExpress range in the UK, though I believe these models will have different styling. First out of the blocks is the Interlink LD, which is nominally 3.2m high although the gas tanks on the CNG powered exhibit take the height to 3.60m. The medium (MD) and high deck (HD) versions will follow. It was shown as a 12.2m long dual door 49 seater with Scania’s five-cylinder, nine-litre, 235kW (320hp) gas engine. The transmission is the ZF 6AP 1400B EcoLife fully automatic. Length options are 11m to 15m, with the maximum on two axles being 13.2m, the centre door position is variable and the interior has a shallower sunken aisle than on previous generations. Also shown on the stand was the 13.7m three-axle version of the Scania Touring, which is bodied for Scania by Higer in China and is already available in the UK. It had 57 seats and the 13-litre 450hp engine. 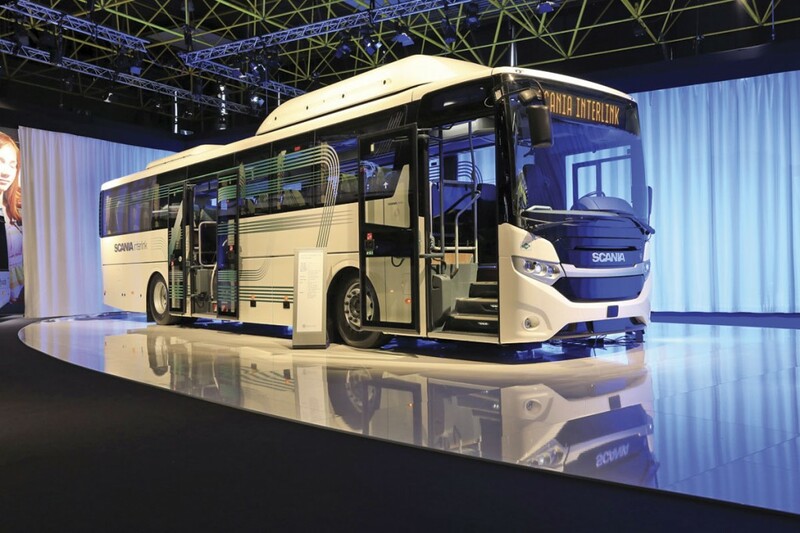 Scania will also be offering the Irizar i8 on its chassis in the UK alongside the i6 and UK MD, Tony Tomsett, confirmed that orders for the model had already been taken. Temsa has been quiet in Europe in recent years, partly because the Turkish market has been buoyant, but there appears to be a new commitment to the European market from the company. We have already seen the latest versions of the HD12 and MD9 launched in the UK and in addition to these the extensive line up displayed included the MD7 mini/midicoach and the new top of the range Maraton coach, which is also the name that was given to the very first coach model Temsa ever developed, back in the 1980s. The first Temsa with a high floor (it is 3.9m high) it is being offered at 12m and 13m. A flat floor is standard and the 12m offers 13 cubic metres of luggage I was told. It will go into production alongside the HD12 and will be offered in both Turkey and Europe with a DAF MX11 440hp engine and ZF AS-Tronic transmission. Asked about a right hand drive version, a spokesman said, ‘Why not’. The MD7 is 7.74m long, 3.35m high and 2.4m wide and offers 4.4 cu.m of luggage. Equipped with a 180hp engine, in appearance it resembles the MD9 but it seats only 33 and the show model had a side mounted lift. VDL’s major launch was the new Futura FDD2-141/510 double decker which we featured in B&CB issue 1344 (11 September 2015). It grows on me every time I experience other double deck coaches. I can stand upright easily on both decks, the luggage space is easy to use, the staircases are easy to use and the lighter colours used inside make for an attractive interior. The latest addition to the single deck Futura FHD2 range is the FMD2-135 two-axle 13.5m coach which accommodates up to 61 VDL Class 100 seats. This wasn’t shown, though the tri-axle FHD139/460 was. It cannot be bought in the UK yet because we are not yet allowed the forthcoming 19.5tonne GVW limit. VDL have uprated the front axle to a 7.5-tonne capacity and use a special Michelin tyre to get the capacity. Also on the stand was the mid-height Futura FMD2-129/370 which has recently won the IBC Economy award. The International Coach of the Year 2014 is the Iveco Magelys, as you will already have read in these pages. As Jury Chairman I presented the award to Sylvain Blaise, head of Iveco Bus, on the first press day. It’s an attractive coach and the Iveco Cursor 9 engine does not require EGR to achieve the Euro6 emissions regulations. 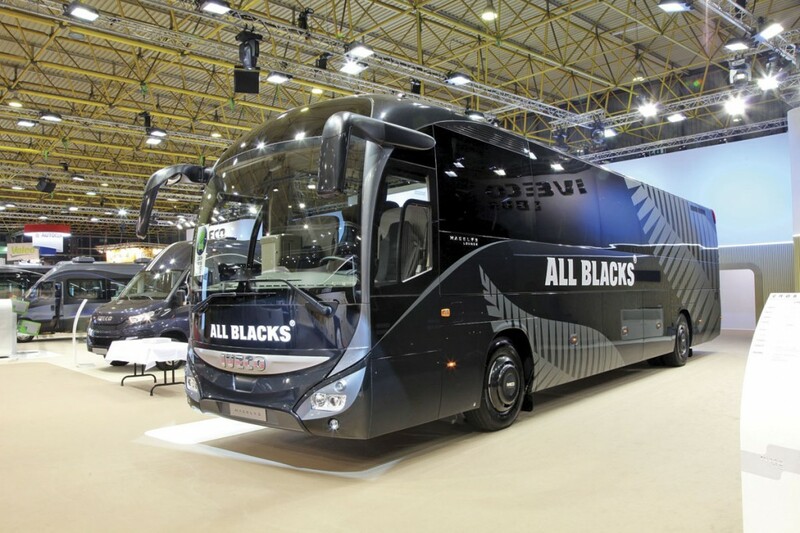 Iveco has just signed a sponsorship deal with the All Blacks rugby team and the Magelys shown, built in France, was adorned with their colours. It was perhaps unfortunate that the French international team was comprehensively outplayed by the New Zealanders on the Saturday night of the show period. Sadly, you still can’t buy an Iveco coach bigger than a Daily in the UK. Unvi’s four vehicle display included a right hand drive 8.96m Voyager GT and an 8.5m Iveco Daily based Compa T 31 seater, as well as an Urbis open top bodied Volvo B5TL double decker with a fully glazed top deck front screen that looked as if it might present decency issues for people in skirts or kilts. The B5 Urbis can be offered in the UK, the first examples have recently joined the Bath Bus Company. A new offering, named the Sil after a Galician river, was a 14m double deck tri-axle coach on a MAN RR4 tria-xle chassis with D2676-LOH31 480hp (353kW) engine. Ordered for use by the Swedish operator, Trosabussen for a service between Trosa and Stockholm, it was unusual in having the second staircase some way beyond the front door which you would think would make the passenger flow difficult. Swedish regulations permit 4.2m high coaches and this was built to this dimension with 73 seats. Maximum luggage capacity can be 9.0 cu.m though this had 6.3 cu.m. The massive Yutong operation anticipates building 70,000 buses of all sizes next year and its aim is to be number one in Europe within five years, which is certainly ambitious. They are represented in the UK by Pelican Bus & Coach whose representatives were present in force to welcome the many British operators attending. MD, Richard Crump, introduced me to Roger Zhou, who said that it was always Yutong’s way to go very slowly at the beginning, send vehicles for markets tests, and then undertake modifications to the designs to meet local requirements. It had developed electric buses ten years ago but only started volume production last year when 1,400 were built. By September over 8,000 had been sold this year in China. The UK is already familiar with Yutong’s TC9 and TC12, but a surprise was the new flagship HTC12, shown as a 12.25m long, 3.82m high, two-axle coach with quite a European look about it. Powered by the 10.84-litre DAF MX11-320 developing 320kW (435hp) at 1,700rpm, it has the ZF AS-Tronic 12AS-2301BO transmission. It seated 48 on contoured seats with lifting headrests incorporating foldable wings and a side slide facility. Spheros air conditioning featured along with variable multi coloured mood lighting in five colours. There were some areas that could be improved including sturdier decency screens and improved toilet access but it had a lot of promise. When the UK gets a tri-axle Yutong, probably toward the end of next year, it will be a development of this design. As well as the TC and HTC coaches, there are IC10, IC12 and IC13 inter city models and the EC10, EC12 and EC13 schoolbus models which are offered in France through the Dietrich Carebus organisation which had massive success with Temsa products when it first started selling in Europe. Xiamen Golden Dragon Bus Company was formed in 1992. I first saw the Explorer body on a Scania chassis at a Busworld Asia Show in Shanghai in the mid 2000s at which time it appeared one of the best offerings from the Chinese manufacturers. At Kortrijk it was shown as an all Golden Dragon built 12.2m long coach featuring a lot of recent enhancements and with power provided by the FPT (Iveco) Cursor 9 SCR-only engine which delivers 294kW (400hp) and 1,700Nm. Maximum seating capacity is 57 passengers and the luggage hold of the high floor coach can be up to 12.8 cubic metres. Some 250 FPT powered Golden Dragon vehicles have been supplied to Israel. To my mind, the XML6121J displayed outside was more visually appealing than the rather heavy look of the Explorer. Among the buses on the King Long stand was a C9 coach. This was just under 9.0m long and 3.435m high over the air conditioning with seating for 35 provided. It was powered by a Euro6 Cummins ISB 6.7E6 310 engine delivering 231kW (314hp) at 2,300rpm and torque of 1,100Nm at 1,200rpm. 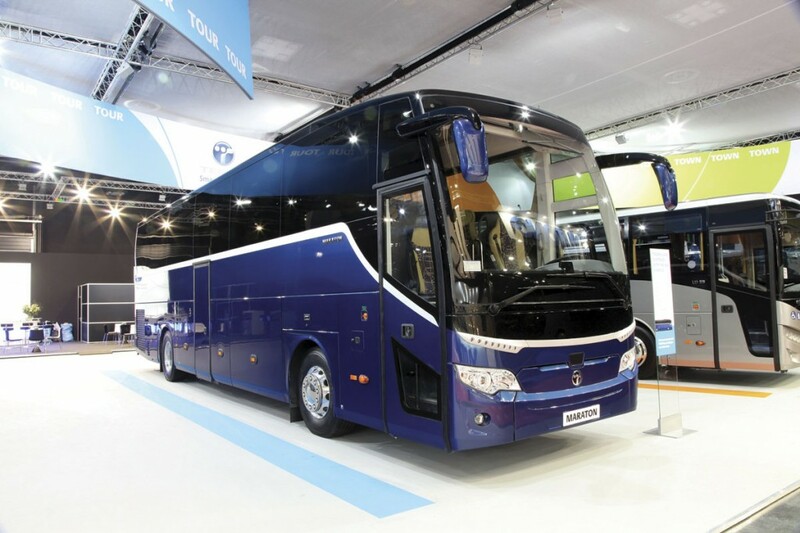 While we are talking about Chinese manufacturers, although BYD did not have a coach product on its stand it is very clear that it sees possibilities for it in the coach sector, as MD, Isbrand Ho explained to me. Using the same driveline as a BYD Bus, a coach travelling at a higher average speed would require energy and might extend the range from 260km to 300-330km. The company was already working on the methodology and calculating how much charging would be required. Beulas exhibited three coaches illustrating the breadth of their range, which is now marketed by the associated Moseley companies in the UK. The smallest was a 27-seat, 7.5m long, 3.15m high Gianino (Stela in the UK) mounted on an MAN chassis, while the longest was a 13.2m long Glory overdeckers on a tri-axle MAN chassis. It seated 53 passengers though 64 is possible. Indcar exhibited alongside Vehixel with whom they work closely. The Next coach, offered in the UK through Moseley on the Mercedes-Benz Atego 10 and 12 tonne chassis, is also available in Europe on an MAN platform. The MAN line-up no longer includes the Starliner but to demonstrate that the company can still produce coaches with a special ambience it showed examples of the Cityliner and double deck Skyliner that had been finished at the Plauen facility where the Starliner was formerly built. The only member of the Neoplan family now sold in the UK is the Tourliner and a 13.8m long Tourliner L model with 2+1 seating for 33 was shown outside. The Mercedes-Benz and Setra vehicles on the Daimler stand had been seen before at the pre-IAA event in Stuttgart. They included the 10,000th Travego and the 10,000th second generation Tourismo, both of which were triaxles, as well as an Intouro M and a Sprinter City65 low entry minibus. 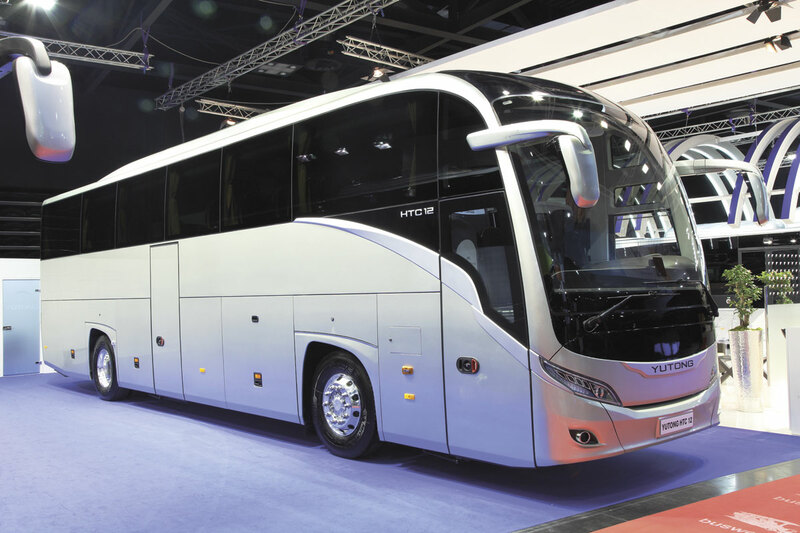 For Setra the line-up included a TopClass S431DT double decker, the TopClass S516HDH the Comfort Class S511HD and the S415 LE Business (which is built in Turkey). Various other vehicles of both brands appeared outside. Two double deckers appeared on the Ayats, one a two-axle open topper and the other a tri-axle coach. I believe the liveries indicated that 2015 is the 110th anniversary of the company’s origins. Unfortunately I couldn’t find anyone on the stand to talk to. Although Solaris did once build the Vacanza coach, which had a rising roof line, the company now specialises in buses, so the showing of a concept midicoach on its stand was something of a surprise, the more so because it is mounted on a British built DAF LF chassis. Essentially for school and feeder operations, no decision has yet been made about whether it will enter serial production. 2.38m wide and 3.14m high over the air conditioning, lengths of 8.2m or 9.6m are envisaged with a maximum of 39 passengers and a maximum GVW of 12 tonnes. The engine was described as the Paccar PX-5 4.5-litre with a choice of three power outputs (152hp, 184hp & 213hp). Mark Noone showed me round the Turas stand which housed three coaches, including a Turas 900 that was attracting a lot of interest. People initially assume it is Sprinter based but it is actually mounted on the Mercedes-Benz Atego 921L. The exhibit was one of six for Bernard Kavanagh of Urlingford, two of which, including the show coach, have rear mounted saloon toilets and seating for 29 rather than the usual 33. Also shown were an Iveco Daily 70C17 mounted Turas 700 with 29 Sege seats and a sliding last row seating arrangement for flexibility in luggage handling and a left hand drive Turas 500 on a Sprinter 519CDi chassis with 16 seats for a Swedish customer. There were a tremendous number of Sprinter conversions shown by converters that included well established names but also others I had not previously heard of and I confess I did not manage to get round them all, often simply because the team were already busy when I called.